Similar to your credit or debit card – the No.1 Currency Prepaid Travel Card is the smart way to manage your foreign currency allowing you withdraw cash at ATM’s as well as using it as you would your VISA or MasterCard at the Point of Sale. Simply load the card with one of three available currencies; EURO, USD or Sterling online or at your local No.1 Currency store and use it abroad in the same way you would your credit or debit card – but with no hidden charges! The card can be used to withdraw cash at over 1million ATM’s in 210 countries and can be used at over 35million acceptance points worldwide – that’s anywhere you see the MasterCard logo. 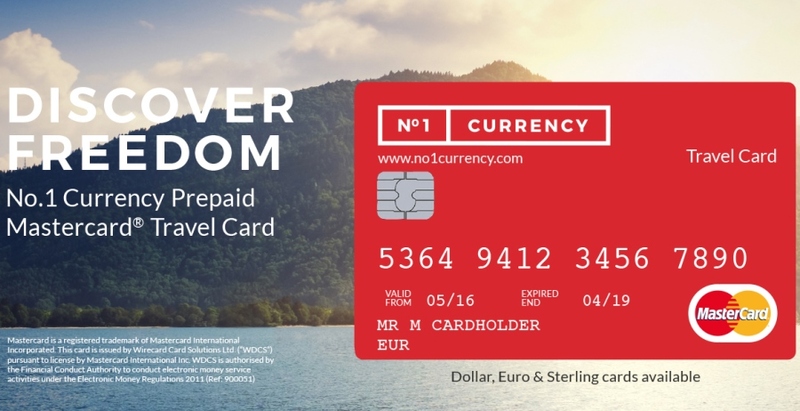 Customers using the No.1 Currency Prepaid Travel Card enjoy peace of mind when spending abroad as they have pre-loaded the card with the exact amount of money they want to spend – helping to avoid going over their holiday budget. The card locks into a fixed rate at the time of loading currency, guaranteeing a competitive rate with no commission charge for customers. In addition, the card is secured by ‘Chip & Pin’ – making it one of the safest ways to access your foreign currency when abroad. Simply log on to https://www.no1currency.com/travel-money-card/ to create your account. Select the currency you wish to load and confirm the amount required. Your card will be delivered within 10 working days. All you need to do then is to sign the reverse of card and call the Activation line to receive your PIN. With the No.1 Currency Prepaid Travel Money Card you have 24 hour online access to your funds. Loading the card is simple and it is a safe and secure way to manage your foreign currency. Visit https://www.no1currency.com/ for more information.